We hope this blog post makes you hungry! Gumbo, snoballs, crawfish, grits, coffee, poboys, and more! 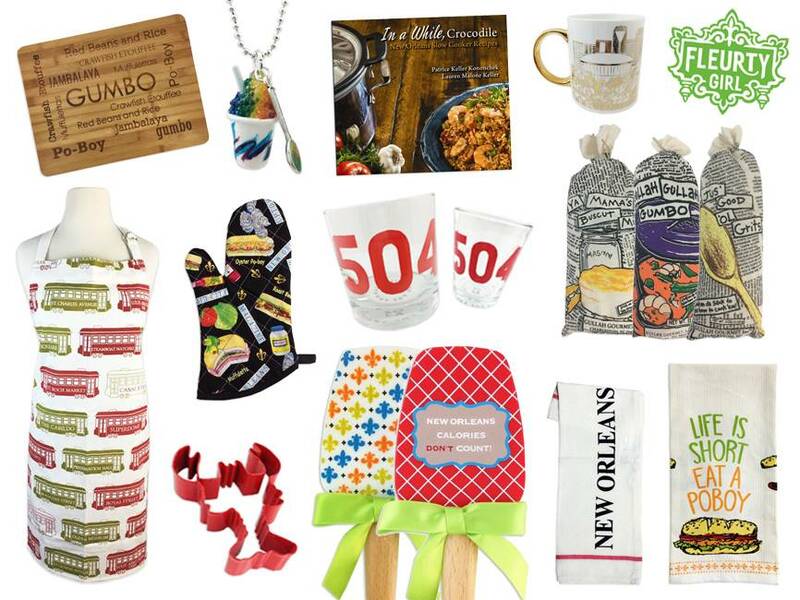 Feed your obsession with NOLA food with these awesome food-related items from Fleurty Girl! 1. NOLA Cutting Board, $36.95. Available in stores and online here. 2. Jazzy Cup Snoball Necklace, $22, available in stores and online here. 3. In A While Crocodile Slow Cooker Recipes, $21.95, available in stores and online here. 4. New Orleans Skyline Coffee Mug, $18. Available in stores and online here. 5. New Orleans Streetcar Apron, $22, available in stores and online here. 6. New Orleans Food Oven Mitt, $9.95. Available in stores and online here. 7. 504 Rocks Glass, $14.95, and 504 Shot Glass, $9.95, available in stores and online here. 8. Biscuit, gumbo, and grits mixes in decorative bags, $9.95-$12.95, available in stores and online here. 9. Crawfish Cookie Cutter, $5.95, available in stores and online here. 10. Decorative NOLA spatulas, $9.95. Available in stores and online here. 11. New Orleans Hand Stamped Towel, $5, available in stores and online here. 12. Eat A Poboy Towel, $13, available in stores and online here.